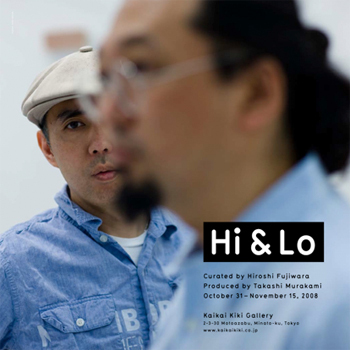 The Kaikai Kiki Gallery is proud to announce that it will be holding the exhibition Hi & Lo from Friday October 31 to Saturday November 15, 2008. The exhibition marks the first time that Hiroshi Fujiwara’s private art collection has been made available for public viewing. Known for his active participation in international art auctions, unique taste, and respected eye for quality, Fujiwara has amassed a distinctive line up of works produced both in and outside of Japan. The event was produced by Takashi Murakami and features curation by Fujiwara himself. From cutting edge young artists like Takeshi Masada to graffiti based artists like Futura, as well as big names like Andy Warhol and Damien Hirst, the wide variety of genres covered could only have been accomplished by someone with the varied interests of their owner. In addition to the works from his collection, the exhibition also features new works by Fujiwara produced specifically for this show. Fujiwara also worked with Takashi Murakami to produce several collaborative items for Levis Fenome, Head Porter, Kangol, and visvim, all of which will be on display and available for purchase. Born in 1964 in the city of Ise, Fujiwara began performing as a DJ in his teens. Since then, he has worked as a creator primarily in the fields of music and fashion and has been credited world-wide as one of the pioneers of street culture. His lifestyle, which casts aside genre and spans interests in sports, art, video games, and the imagination has been introduced in many media, making his very existence a force of cultural influence.